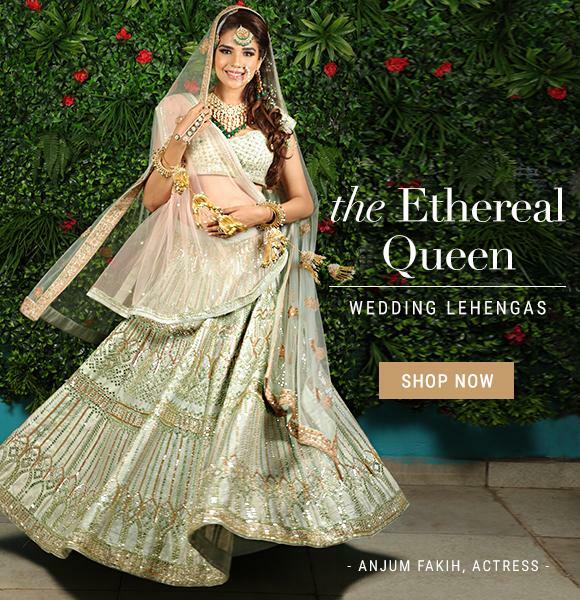 The eloquent Indian attire preferred by brides across the world, Lehenga Choli is the exemplary dress that can transform your entire appearance and give you that regal Indian look. Exquisitely crafted with delicate embroideries and dainty embellishments, the Indian Lehenga is the garment that can bring your bridal dreams to life. Come and explore online, the gallery of gorgeous lehengas in mystical hues and designs at the house of KalkiFashion.com. A lehenga or Indian lehenga choli, also known as Indian Ghagra Choli, is a popular form of Indian Ethnic wear that comprises of a pleated or flared skirt (Lengha/Ghagra), a cropped blouse baring the mid riff (choli) and a stole (dupatta). Women from various age groups and ethnicity love to sport this outfit and the lehenga choli is also an extremely popular wedding attire for brides and bridesmaids. Lehengas are available in many styles, and apart from the traditional ones, the modern renditionsof this popular dress like the fish cut lehenga and jacket lehengas are also very common to spot at weddings and other festive occasions. At any Indian wedding, or wedding party, one can spot stunningly gorgeous party wear lehenga choli designs like bridal lehengas, bridesmaids’ lehengas, and designer lehengas etc. The intricate embroideries and craftsmanship behind designer lehengas are easy to spot with embroideries like zari, zardozi, shimmer, sequins, Gotapatti work etc. How to choose the perfect lehenga? For weddings and other elaborate functions, heavily decorated and ornate lenghas make a great choice. For simpler occasions like poojas and family gatherings simple and comfortable fabrics with delicate embroideries work great. The colours and fabrics of the lehenga would also depend upon individual tastes and preferences. 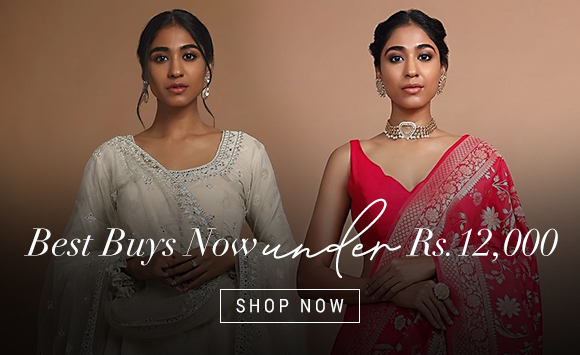 So whether you decide to opt for a bright hued net lehenga or you settle for subtle georgette and lace lehenga, you can easily shop online at KalkiFashion to get the best in the category like a Red lehenga or a Green Lehenga, delivered to you right at your doorstep. We have special category pages like jacket lehengas and bridal lehengas to help you make choosing Lehengas online easier. A simple measurement form that you fill, can help our team of designers create the custom fit for your size and save you the hassle of going back and forth to a boutique. For more lehenga inspirations, like Bollywood lehengas or celebrity wear lehengas collections, you may check out our blog and the designer lehenga page to shop online and buy the best of exquisite designs and patterns. Shopping for lehengas has been easier! Fashion has been in the scene since the Medieval Era era when every single piece of art was beautiful in execution, be it the clothes or the accessories. A bridal lehenga or a party lehenga is the favorite Indian wear for every bride who wish to look the best on her wedding day. Every Indian girl visualizes herself in a splendid lehenga choli at her wedding or if she happens to be a bridesmaid accompanying the bride. The traditional lehenga choli is the preferred attire in the wardrobe of an Indian bride for many ages now and today it has undergone some superficial and cosmetic changes. The humble lehenga was once a daily wear but over the years, it significantly transformed itself into a stylish looking piece of dress that is both beautiful and grand in appeal. Modern day lehenga is an entirely inspired outfit from the standard skirt or a ghagra that was created by some of the leading Indian fashion designers. The ghagra choli is one such classic example of traditional Indian clothing that is now regarded as an exclusive bridal wear among girls in North and South India. Apart from the ghagra choli it is highly decorative dupatta that forms a fashion accessory. It is generally worn in a seed pallu style with the length of the scarf tossed over the shoulder from the back. Nowadays, it is additionally worn like a scarf or even carried in different styles. Indian lehenga skirts are now beautifully designed and handmade by the leading Indian fashion clothing companies who produce some stunning looks wedding gowns and bridal gowns in gorgeous colors. The finest collection of Indian lehenga online is now available at KalkiFashion.com, that offers the most alluring and unique collection. We try to make the best outfit using high-quality fabric materials that enhances the beauty of a girl. In South India, the trend of Chania choli is hugely popular as it is worn by girls before puberty until they start wearing a saree at a later age when they are married. A choli which is body hugging and well-fitted, looks extraordinary and appealing. Kalki Fashion brings for you traditional style lehengas & cholis, as we design the best of Indian lehenga choli that is loved by all our high-profile clients. Viewing these outfits online is definitely a treat for the eyes as we present you some of the most beautiful in Indian clothing designs. The Mughals had come up with a modified version of the lehenga from its authentic designs and flares. It had attained the status of a royal attire that is mainly related to affluent people who wear it on special occasions. That is even worn today. Kalki Fashion brings for you a collection of those typical Muslim Passa that you will love to experiment with. Indian designers love to play with alluring lehenga styles which makes it the hot favorite among designers. The sheer elegance and richness of this attire is visible to all and one can now buy lehenga choli online from exclusive fashion clothing stores like us. The lehenga is mostly made from silk that is sourced from different parts of India and China. Bangalore silk lehengas, Mysore silk lehengas, Assam silk lehengas are probably the most sought for after lehengas among customers. The rich embroidery work, brocade work, Zari work and Zardozi work add volume to a skirt or a bridal gown that must look gorgeous. The lehenga with a crop top is very much en vogue these days. Fashion clothing portals like KalkiFashion.com is offering a whole new collection of lehenga online which are produced from the best quality fabric material and accessories. The cotton lehenga is extremely eye-catching and when it is paired with a sequin dupatta, it adds up to the existing looks. An array of of embellished and embroidered lehengas are now available at KalkiFashion.com throughout the year. Some lehengas are in exquisite handloom work like kalamkari and chikan karri. Square printed as well as tie and dye printed skirts are enchanting that looks beautiful when combined with intriguing shades. Our typical lehenga choli online includes ikat, manga girl, kalamkari, zardozi, Maheshwari, leheriya, batik, bandhni, and other styles. These styles are best depicted on a lovely lehenga skirt. Lehengas for wedding are much more heavier as that includes intricate embroidery work. KalkiFashion is one such online fashion store that offers the best in lehenga choli design that is simply outstanding and unique. The cholis are nicely made to pair with the gorgeous dupattas to complete the entire look of a woman. Buy lehenga online from Kalkifashion.com and get to view a riot of colors, cut and style that is not possible to find in any other women’s fashion clothing store. Grab your choicest of wedding collection at KalkiFashion and look incredibly gorgeous and attractive.